Built around its 5.0MP CMOS sensor, Celestron's 44341 LCD Digital Microscope II is capable of capturing high-resolution color images and videos at 30 fps. You can view them on the built-in 3.5" color LCD display with an effective magnification of up to 400x or (with additional 4x digital zoom) on an external monitor with magnifying power of up 1600x. Also noteworthy is the 3.5 x 3.5" mechanical stage. The stage features a full X-Y motion control using two precision Vernier micrometers and offers a metal bracket for holding your specimens. To make saving your findings a seamless experience, the LCD module offers an easy-to-use control panel, a 32GB microSD memory slot, and a mini-USB data port. To provide vivid and crisp images, the optics feature achromatic objectives and bright 8-LED illumination system with adjustable brightness. In addition to digital output, this scope features an AV video out port. Its construction features an arched frame to serve as a carry handle and a 4 x AA battery compartment for cordless operation in the field. Using four alkaline AA batteries will allow you 3 hours of uninterrupted, cordless operation. 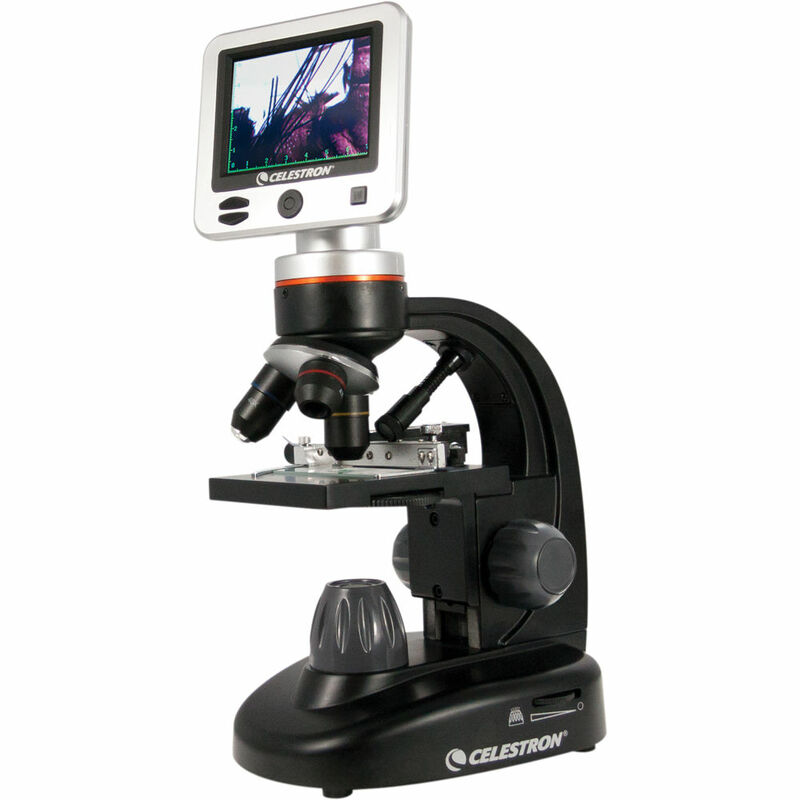 Box Dimensions (LxWxH) 16.0 x 9.3 x 7.5"
44341 LCD Digital Microscope II is rated 5.0 out of 5 by 2. Rated 5 out of 5 by Lori from LOVE IT I got this for my 10 year old grandson who absolutely loves it. Very easy to use and fun. Everyone enjoys looking at all of the slides and very educational. Rated 5 out of 5 by Security John from Surprising features for the price ! A very well built, easy to use microscope . The LCD Digital Microscope II can produce a magnification of 400x, which is the minimum needed for studying cells and cell structure. Yes. You will need to mix the small blood sample to water on a slide. Add a coverslip and you can see the red cells for a few minutes. They will start to explode when they fill with water. To keep them from doing this, you would need a solution that matches the water content of the cells. I think you might get by with a saline eye drop solution. It will be hard to see white blood cells without some type of stain. I bought this scope last year to show things to my granddaughters with the video screen. It works OK. I taught HS Bio for 40 years, and used scopes that cost over $2000. I am disappointed with the poor resolution of the video, and the fact that it does not stay in focus, but for general looking at stuff, it will do. Does this microscope come with a cover? Will this microscope work with Windows 10? Is it compatible with iMac desktop with Yosemite operating system? With these digital microscopes they act like thumb drives. So once you connect the model it should detect the operating system without any issues. Does anybody have image samples from this microscope's camera? And what formats does this capture in? Can I measure particle size using this microscope? Some microscopes come with a scale or reticule, can I purchase a separate scale and use it with this microscope? I tried to check the grid but have misplaced my power cord. I have to order a new one. Sorry for not being able to answer this for you. I have some photos I took with the scope and will check to see if the grid was on for any of them. If so I will send the image to you. what is the working distance of the three objectives. Does this model has long working distance objectives? It varies as to what you are viewing with the microscope. With the 4X Objective Lens I would say you can focus about a half an inch roughly.